First Hotline foal born in Canada – and a true beauty! Elegant, uphill, leggy and correct – and boy, can she move, with great power and push in her canter, a light, rhythmic trot, and a long slinky walk. Lea seems to have inherited her mom’s grace and sociability, as well as her father’s athleticism and power. Sire Hotline was Champion of his licensing in 2005, and won his SPT in 2006 scoring a “10” for rideability, and 9s for movement. 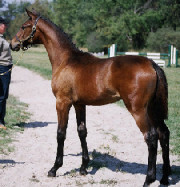 This highly trainable stallion is from Hofrat (Gribaldi son) out of a DeNiro / Wendepunkt dam. 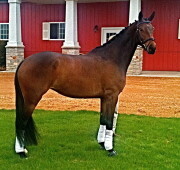 Wonderful breeding for dressage and general athleticism! 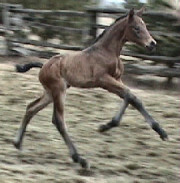 This lovable filly was SOLD in-utero to Minnesota. She is pictured at days old, 5 months, and 4 years. UPDATE: In 2011, Holeandra competed in the USDF FEI Young Horse Finals, coming a very respectable 8th for the USA in the FEI Four Year Old division.